She is wearing a pink studded collar with the studs falling off. Has a scar on her nose from where another dog had got her. 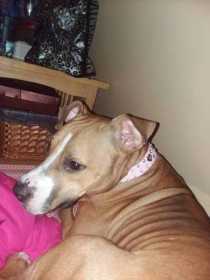 She is brown and white skittish around adults that great around other dogs and children.